PSRC used the INVEST 1.0 System Planning module to evaluate the update to Transportation 2040, the region’s long-range transportation plan, to better understand where sustainability principles can be better incorporated into the planning process. PSRC then developed approaches to improve in two particular focus areas identified through the INVEST evaluation – transportation demand management (SP-9) and linking asset management and planning (SP-13). The 2014 Transportation 2040 update responds to challenges presented by the economic downturn, new information and trends, and emerging issues. 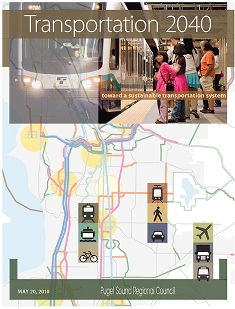 The plan has maintained its vision of a safe, efficient, and environmentally sustainable multimodal transportation system through the implementation of an integrated mobility, environmental, and financial strategy. Issues such as an increasing need for maintenance and preservation resources coupled with drastic cuts in projected revenue reinforced the need for the region to implement a process that makes the best use of diminishing resources and prioritizes investments in a manner that best implements VISION 2040. Key factors shaping the update include responding to new fiscal realities, maintaining critical transportation investments, and making progress towards greenhouse gas reductions. PSRC evaluated the draft Transportation 2040 Update using the INVEST 1.0 System Planning module with a focus on identifying areas of strength in Transportation 2040 as well as areas where we can improve our planning practice. Additionally, it was important to be able to provide FHWA with meaningful feedback regarding the tool’s strengths and opportunities for improvement. Transportation 2040 scored nearly 80% of available points to achieve a “Platinum” designation. Performance-Based Planning and Monitoring. PSRC should continue its work to incorporate performance-based planning principles to support informed decision-making and meet MAP-21 requirements. Incorporating Health Impacts into the Long-Range Planning Process. PSRC should better incorporate health and health-related goals in the regional planning process and evaluate health-related impacts of transportation investments at both project and systems scale. Transportation Demand Management (TDM). With the current role PSRC plays in region regarding TDM, the agency should work to develop TDM program monitoring and measurement framework at the local and regional scale. Analysis Methods. An opportunity exists to better incorporate the stated sustainability principles and include resources necessary to carry out activities contained in the agency’s five-year data systems and analysis development plan. Asset Management. PSRC should develop a regional asset management planning approach that allows for systems-level, performance-based analyses. Infrastructure Resiliency. PSRC should evaluate ways in which it can add value in transportation system security and infrastructure resiliency planning. More details on each of these recommendations can be found in the full report. PSRC staff inventoried the type and characteristics of current TDM activities in the region. The information gathered has already been helpful as PSRC and the TDM Steering Committee begin implementation of the Regional TDM Action Plan. The inventory informed the development of the performance measurement approach, which in turn led to the development of a pre-proposal to FHWA’s Office of Planning, Environment, and Realty to begin utilizing electronic fare data to better associate TDM activities with specific outcomes. A regional TDM Performance Measurement Working Group was recently formed to improve local and regional measurement of TDM impacts. This group will use the information gathered via the inventory and the product developed as part of the performance-measurement task to advance TDM performance measurement at PSRC. Additional information on the project can be found in PSRC’s full report - Appendix C.
Using INVEST resources, PSRC reviewed regional asset management program best practices, gained a better understanding of how local asset management programs can be leveraged into a regional effort, and researched asset management software suitable for a regional program. PSRC is currently working with the Transportation Policy Board to define long-term goals and craft a program that satisfies new MAP-21 requirements and adds value at the local level. Additional information on the project can be found in PSRC’s full report - Appendix D.
A potential framework for TDM monitoring and the enhancement of the regional TDM program.